The Dorabella cryptogram, an encrypted message left behind by British composer Edward Elgar, is one of the most famous crypto mysteries in the world. Here are two more crypto mysteries Elgar created. They have not received much attention so far. Readers of this blog are certainly familiar with the Dorabella cryptogram, an encrypted text created by British composer Edward Elgar (1857-1934). Like many other musicians, Edward Elgar had an interest in cryptology. The ciphertext we know as Dorabella cryptogram today was included in a letter he wrote to his female friend Dora Penny on July 14, 1897. Considering that Dora Penny did not know much about codebreaking, one could expect that these encrypted lines are easy to decipher. However, neither Penny herself nor anybody else has ever found the solution of this challenge, though many have tried. 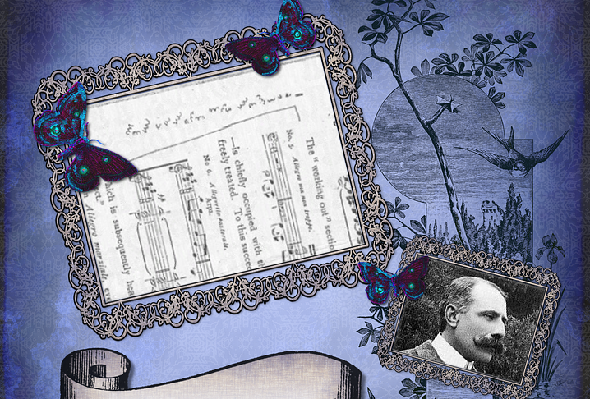 While the Dorabella cryptogram has become one of the world’s most famous crypto mysteries, it is much less known that Edward Elgar left behind two more encrypted notes that are unsolved to date. They use the same alphabet consisting of semicircle symbols. The main source for these cryptograms (and a few other cryptologic dalliances Elgar occupied himself with) is the book Unsolved! 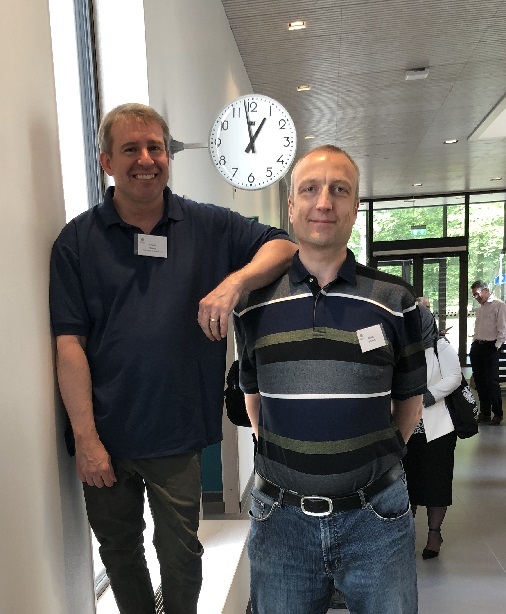 written by Craig Bauer (the following picture was taken at the HistoCrypt in Uppsala; yes, I am a little taller than Craig). The meaning of this ciphertext is unknown. According to the Futility Closet article, a certain Anthony Thorley suggested that the cleartext was GETS YOU TO JOY, AND HYSTERIOUS, where the last word is a portmanteau combining hysteria and mysterious. However, this solution doesn’t make much sense to me. 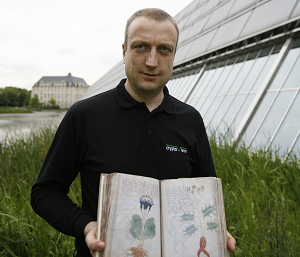 Will these two mysteries help to solve the Dorabella cryptogram? While the Dorabella cryptogram is well researched, the Liszt fragment and the Cryptogram card have received little to no attention in the crypto community. It is not known whether these two additional unsolved cryptograms are encrypted in the same way as the Dorabella cryptogram. Anyway, it is worth studying them, as they might help to understand how Elgar used encryption. If a reader can draw any conclusions from the Liszt fragment or the Cryptogram card, please leave a comment. I didn’t realize there were others, using the same characters. That certainly seems like a great help… well, if it is the same underlying system. Sorry to say: but there will never be a solution to all and any of the three parts of the pseudo-Elgar cryptogram: the “Dorabella-autobiography” part, the “Liszt”-part, the “Marco”-part. Because it’s a fake, fraud – whatever you want to call it. Successfully committed by Dora. – So is the enigma-enigma in the “Enigma-Variations”, hyped since the mid-fifties by American music critic Irving Kolodin. If the two “Marco”-pages were written by Dora Powell, would she have enciphered “Marco Elgar” first? Could she have been inspired by Marco’s tombstone which you pass on the way into the museum? Not likely, since Marco died in 1939, but the “Dorabella-cipher” first appeared in 1937. However, she must have known of Elgar’s devotion to Marco, made so public from the 1927 broadcast. Thus it is very possible that Dora Powell could have enciphered MARCO ELGAR in the note book to pseudo-authenticate the two pages as being written by Elgar. – The two notebook pages are coherent; we follow a person’s thought on a possible cipher, which, at the end, he/she seems to abandon. The thought process briefly switches to numerals, then stops abruptly on a square “4”. Let us assume – in dubio pro reo – that Elgar himself wrote the “Marco”-pages, and that Dora based her fraud on their design. An very important, very obvious question arises: why would someone re-invent the wheel, after he had handled it already in 1886 and 1897? The “Marco”-pages are not an attempt to reconstruct a rather simple substitution cipher from 40 years ago – no, they newly create and design the possibilities of a cipher hinging on two factors: amount and angle of a semicircle. That the original concept may have arisen from the handwritten letter “E” is possible. – Let us also keep in mind that the two key support documents – Liszt-program, Marco-pages, are housed in the Elgar Birthplace Museum. To the contents of which Dora could have contributed, or the contents of which she could have “embellished”. See below. • 0°-1: 1/5; 3/26 = 2 | 0°-2: 1/1 = 1 | 0°-3: 1/, 8; 2/6, 9; 3/19, 24, 27 = 7 | Total of 10. • 45°-1: 1/14; 2/; 3/,  = 4 | 45°-2: 1/3; 2/10, 13; 3/1, 6, 12 = 6 | 45°-3: 1/11, 28; 2/19, 30 = 4 | Total of 14. • 90°-1: 1/23, 27; 2/15; 3/10, 18, 21, 25 = 4 | 90°-2: 1/6, 19; 2/4, 14, 21; 3/3, 14, 23 = 8 | 90°-3: 1/16 = 1 | Total of 16. • 135°-1: 1/9; 2/7, 27, 28 = 7 | 135°-2: 2/8 = 1 | 135°-3: – = 0 | Total of 5. • 180°-1: –; 180°-2: – | 180°-3: 1/2, 20, 21; 3/20 = 4 | Total of 4. • 225°-1: 1/13; 2/16, 24; 3/16 = 4 | 225°-2: 1/12, 15, 17, 18, 22 = 5 | 225°-3: 1/29; 2/23, 31; 3/2, 5, 11, 17, 22 = 8 | Total of 17. • 270°-1: 1/7; 2/1, , 5, 17 = 5 | 270°-2: 2/22; 3/4, 8, 15 = 4 | 270°-3: 3/9 = 1 | Total of 10. • 315°-1: 1/26; 2/26, 29 = 3 | 315°-2: 1/10, 25 = 2 | 315°-3: – | Total of 5. The quantity of signs at some angles, whether one, two or three semicircles, appear to be dictated not by any cryptological system, but rather by graphological preference or discomfort, the relative lack of signs at 180° and 315° degrees, whether one, two or three semicircles, being the most obvious. At the same time, odd preferences emerge, to wit two semicircles at 90°: four in line 1, eight (!) in line two, but only one in line 3. Assuming this sign to represent the same letter: what letter of any alphabet appears in such a distribution in any language? Is it like the Danube at Möhringen: now you see it, then you don’t? B P E C A H T C K Y F R Q D R I/J R R H P P R [D/G] [T/X] Y X G F S.
Not good reading. However, one unusual aspect jumps out off this gibberish: the paucity of vowels. Three vowels in line 1 (10%), two vowels in line 2 (6%), and – granting A-status to the penultimate – four vowels in line 3 (rounded up, 15%). Maximally nine vowels per 87 signs constitute 10.3%. It is difficult to think of this paucity of vowels in relation to the “Marco”- monoalphabet as being coincidental. I think the reduction of vowels – in relation to the “Marco”-pages – was one of Dora Powell’s means to intentionally make her “cipher” unintelligible. However, since the “Marco”-alphabet suggests different sequences of angle, while maintaining the sequence of one, two, three semicircles within each group (I! ), I shuffled the sequence of angle-triplets by keeping the original plaintext alphabet intact: A, D, G, K, N, Q, T, X would always be one semicircle, but at any of the eight different angles, the doubles in the middle would remain the same, C, F, I/J, M, P, S, W, Z would always be triples. All these attempts quickly turned to naught: once you try one set of 3, the consonant bottle neck in the middle of line 1 will dictate where a vowel is needed, which brought more consonants with it, which left the “text” unintelligible. The reader can try it for her/himself; I shall not bother to list my attempts. I went a step further and arranged the plaintext alphabet backwards, from Z to A, then – staying true to groupings of three – attempted the same variations as mentioned above. To no avail. Wasted time. The margin cipher in the 1886 program – which needs to be read sideways – does not fare better: F H S T R S G B H I/J E T S H M U/V Q T/X in the “Marco”-cipher. Three possible vowels out of eighteen letters equal – rounded up – 17%. I have not attempted any shufflings on these signs. The thirty letters of “Shall I compare thee to a summer’s day?” display 40% shiny golden vowels, even were it “you” instead of “thee”. Unlike Shakespeare’s summer, the “Dorabella-Cipher” hath had all too long a date. Finally: please notice that I have not attempted a “free” arrangement of the alphabet – plaintext sequence B to A, or random sequence – because that has been sufficiently attempted in the past seventy years or so. Since Ernest Newman in 1939 (London Times), and Irving Kolodin in 1953 (Saturday Evening Post) have put the musical “Enigma” and, along with it, the “Dorabella Cipher” into the lime light, a lot of squeak and gibberish – the reference is to Shakespeare’s Horatio – has successfully been published about both, by Sams, and many others. Are there precedents to Dora Powell’s pseudo-cryptologic “embellishments”? Quite so. A little over one hundred years earlier, in 1835, Bettina von Arnim had published her famous “Goethes Briefwechsel mit einem Kinde” (“Goethe’s Correspondence with a Child”). As Dora Powell published her memoirs of the most famous British composer of his day after his death, so did Bettina publish her letter-exchange after Goethe’s death in 1832, the most famous German writer of his day. That both Bettina’s and Dora’s memoirs about the famous dead were published three years after Goethe’s and Elgar’s demise, is coincidental. I call both women by their first name because Bettina is equally well known as Bettina Brentano before she married Achim von Arnim, while Dorabella’s “cipher” supposedly dates back to before her marriage, while the “cipher” did not see the day of light till after she had married Richard Powell. Bettina’s book was a literary success. However, when some of the original letters were discovered, and published in 1929, it turned out that Bettina’s versions thereof were, to a large degree, rewritten, or altogether fictitious. In addition, she did little sleights of hand, such as including authentic poems by Goethe as being addressed to herself, while they were actually addressed to another woman. Bettina knew Goethe and his mother since 1806, Frankfurt being their common ground. In 1811, a minor quarrel between Bettina and Goethe’s wife occurred at an art exhibition of works by Goethe’s friend Johann Heinrich Meyer. Bettina made a derogatory remark about one of Meyer’s paintings, and angry Christiane Goethe tore Bettina’s glasses from her face. Upon which, memorably so, Bettina called Christiane “eine wahnsinnige Blutwurst” (an insane blood sausage). Needless to say, despite Bettina’s repeated attempts to fall back into Goethe’s good graces, she never did. – Besides her linguistic abilities, Bettina was widely gifted, in music (in 2011, she became a candidate for Beethoven’s “Immortal Belovéd”) and art; near the end of her memorable life, she engaged herself in social causes. She was no “crook”. For whatever need, however, she suggested to herself and others her deep emotional and intellectual bonds to famous people, and publicized these bonds after the famous person’s death (e. g. already after the suicide of her friend Günderode in 1806). Perhaps a borderline-personality, whose main trait is lying, or rather: enhancing the truth, and believing it her-/himself. Dora was not of Bettina’s caliber. However, in similar fashion, she depicted herself as Elgar’s innermost confidante, who understood his music, his musical allusions etc. better than anyone else. Did Elgar solve John Holt Schooling’s fourth cipher – Yes. Did Elgar write the “Dorabella Cipher” and “Liszt” scribblings – definitely not! 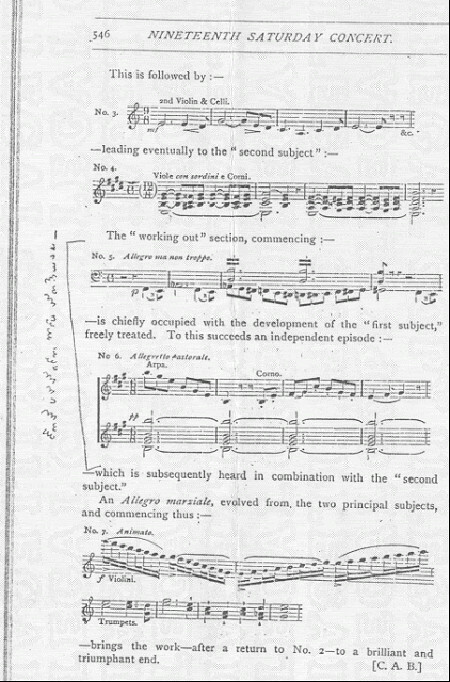 Addendum: since footnotes don’t show in my previous post, here is the earliest and best link to the “Marco”-pages, “Appendix d” in the last article by Eric Sams: http://ericsams.org/index.php/on-music/essays/on-elgar/111-elgar-s-cipher-table. Should like to add that the symbols on Craig’s “cardlet” are very similar in nature to the groupings à 3 in the “Marco”-pages: experimentation with angles of augmented and diminished semicircles. 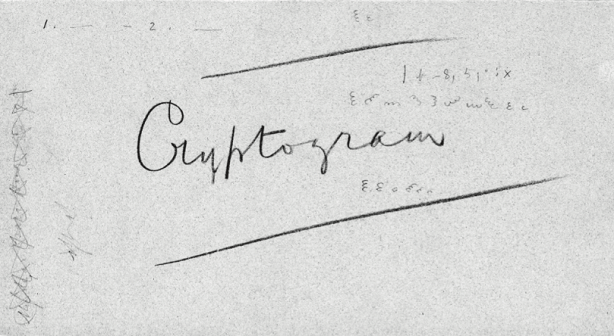 While the word “cryptogram” may be in Elgar’s handwriting – I am not familiar enough with it to come to a conclusion, the surrounding squiggles are certainly not by Elgar. However, they change my leanings regarding the authorship of the “Marco”-pages: NOT by Elgar, either. Thank you very much for this profound essay!